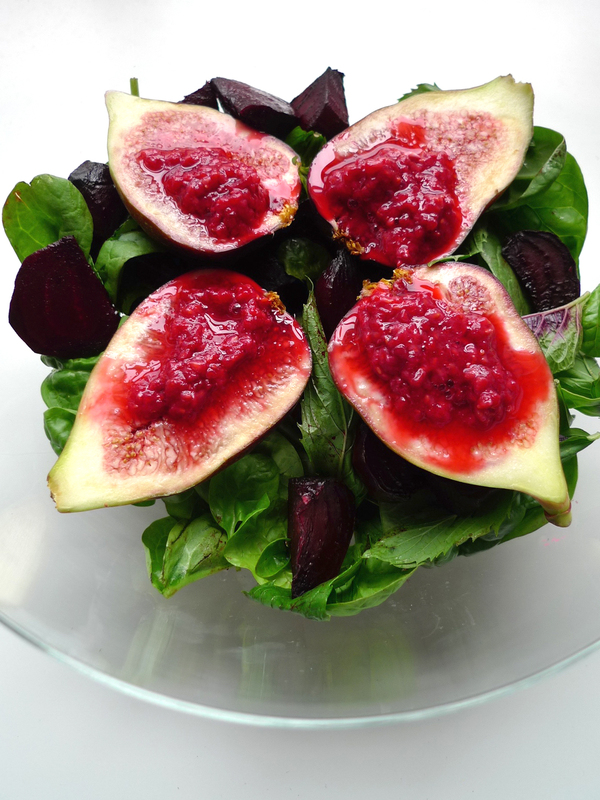 This salad is simply beautiful with the green of the leaves, purple of the beetroot and reds of the figs and raspberries. In this dish I’ve tried enchoy, a new leaf that I found at the market. It’s a chinese salad from the beetroot family, similar to the leaves at the end of the beetroot stalk. If you can’t find enchoy, the beetroot leave will give the same bitter taste. As it is bitter, use less of it than the spinach. The Vinaigrette helps to soften the bitter taste of the enchoy while also giving a fantastic ‘detox’ effect with the raw garlic, apple cider vinegar and ginger (perfect to help digest the Christmas Feast if this is an accompanying salad or even on it’s own). While these ingredients are not great for FODMAP or fructose-intolerance diets, I find that every now and then the health benefits they provide outweigh any discomfort from the fructose, but I’ll leave that for you to try. Peel the beetroots and cut into quarters. Arrange in a baking dish and toss with oil and salt and pepper. Cover with tin foil and bake for about 45 minutes. Take out of oven and let rest until cool. Meanwhile, prepare the Vinaigrette. Blend the frozen raspberries, vinegar, ginger and garlic until smooth. Drizzle in the olive oil while whisking together. Store the remaining Vinaigrette in the fridge for up to one week. 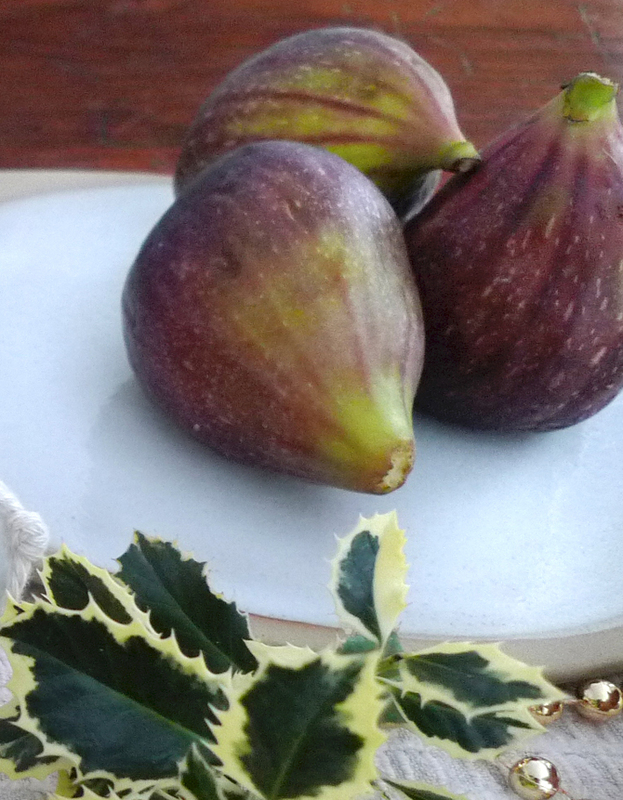 Clean and Dry the leaves and figs. 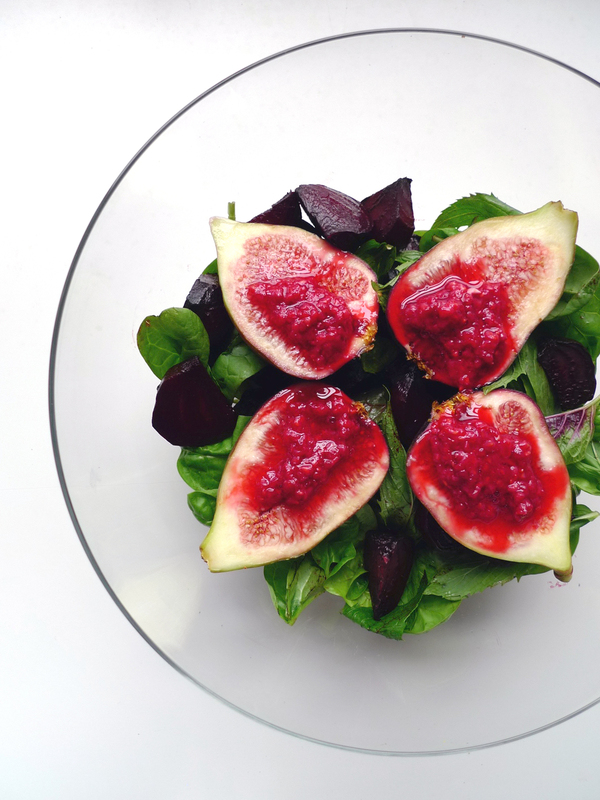 Arrange with beetroot into a large bowl or on individual plates. Top with chopped raspberries. Drizzle Vinaigrette lightly over salad. – For a more fructose-friendly version of the Vinaigrette, omit the garlic and replace the apple cider vinegar with lemon juice. – Optional, add orange slices to the salad or replace beetroot with oranges.